Set to a stunning manga style backdrop Dofus is a free to play MMO RPG that brings a mix of interactive cartoon and video game creating a new style of online game. Whilst quite casual in many aspects there is undoubtedly the more hard-core element to the game providing a challenge to the more experienced users while still being accessible to new ones. Rereleased and it’s called now rewritten using action script 3 to create a more stable, responsive and all around faster flash game as well is having new animations and maps redrawn the game offers something new even to those original players. 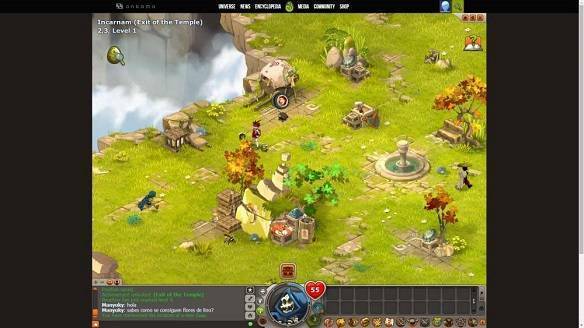 Set in The World of 12, though more commonly referred to as Dofus World, you take on the role of your own character and select one of 16 available classes in this 2-D isometric MMO, each of which has their own unique abilities, skills and spells. Exploring this vast and rich world you will fight a number of monsters along the way and complete challenging and story driven quests, being rewarded with items and experience. As you level up your character will periodically receive extra boosts and bonuses such as a special aura at level 100 then again at level 200, which is the max level for the game. Combat is very much turn-based, though still taking place in real time, and players take turns to put together a combination of attacks and moves in the designated time limit. When a player engages a monster they are actually transported over to a copied version of the map where the actual fighting will commence, making an instance for that player but no further players are allowed to join once fighting has begun. Using a variety of spells in their arsenal which can be used to attack, both, heal and more players and monsters use Action Points and Movement Points to make their attacks. Players are able to align themselves between one of the two cities locked in war, the City of the Angels (Bonta) and the City of the Devils (Brakmar), whereby doing so players will be rewarded with items and such abilities as wearing shield whilst getting access to unique areas as well as the resource is within them. The territories of the game world are sometimes divided between the two factions, when playing in an area controlled by your faction/alignment then you receive a boost in XP and drops whereas your rival faction gets less XP and a lower drop rates and items.